Growing up…Kyle Walker was a picture I found in the family photo album of a nice, distinguished looking man standing next to a white picket fence. He was a man, who as my grandmother proclaimed, kept a human skull on his mantle. Kyle Walker was also my great grandfather. murdered in 1895 and his body thrown into Lake-Walk-In-The-Water near Bartow, Florida. Matthew had collected his brother’s bones and it was Matthew’s request that Joel’s remains be buried with him at his own death. The family secrets began spilling out! Recently newspaper articles have been found, which seem to explain the skull. Joel’s body was found half buried in mud at the mouth of Tiger Creek in Polk County. The coroner held an inquest over his remains with the skull, under jaw bone and other articles being taken into evidence. It is believed that after the sensational trial concluded, the skull was returned to the family where it would rest on the mantle of his brother…for a time. NOTE: Refer to “Joel Walker, Murder Revealed” elsewhere on this site. small percentage of people living in Polk County for that year were accounted for. Kyle was living on his own in 1880, therefore is not listed with the family, but Bible records kept by his daughter-in-law, Alma, along with his brother Matthew Walker’s obituary, and a phone interview with the widow of his nephew, who now is in her nineties, confirm his place in this family. Kyle married Martha Jane (Mattie) Mathis January 19, 1889 in Arcadia, Desoto County, Florida and this is where they started their family. Their first child was born in Arcadia. Kyle soon began moving his family from place to place. While his siblings were comfortable remaining close to their roots, Kyle was not. 1900 found him living in Ft. 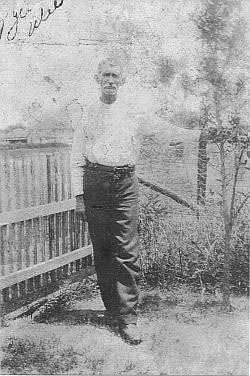 Drum in Brevard County and in 1908 he is living in Ft. Pierce, St. Lucie County. It was while living in Ft. Pierce, that tragedy struck and Kyle and Mattie’s son Claude lost his life swimming in an underwater race with a group of his buddies. The family picked up and moved back to Ft. Meade for a number of years, to be closer to family. Here another child Fred succumbed to Cerebral Meningitis in 1921. Kyle eventually settled in Ft. Myers, Lee County, after briefly living in Hillsborough County. He is shown there with his family on the 1930 census. Kyle and Mattie were the parents of twelve children; Clyde, Claude, Beulah, Lola, Carl, Helen Belle, Harley, Myrtle, James (Barney), Fred, Theda and Sherman. The Indians of South Florida referred to Kyle as “Little Big Man.” He carried a bullwhip on his side, which he liked to use on a whim. The Indians reportedly were in fear of Kyle, thus earning him the title. His children left home early to get away from the outbursts of temper he often displayed. When his health started failing and senility began to set in, Kyle was committed to the Florida State Hospital, where he died on October 23, 1934, after having been confined there for seventeen months. He is buried on the cemetery grounds of the hospital. His death certificate states he died from Cardiac Decomposition as well as “Senile Dementia.” Before the old age assistance program was introduced, senile patients whose families were unable to care for their loved ones at home were often sent to the State Hospital. Kyle was a farmer, but tried various occupations including… butcher and mail carrier.